Highland distillery Tomatin is launching a trio of travel retail exclusive Scotch whiskies, to join its existing 12-year-old single malt expression. Due to launch in airports across Europe over the next few months, the three duty free exclusives will comprise an eight-year-old, a 15-year-old and a 40-year-old ‘rare’ vintage. Tomatin 8 Year Old has been aged in both Bourbon and Sherry casks before being bottled at 40% abv. It will be priced at €35 per one-litre bottle. The 15-year-old single malt has been matured in North American oak casks and bottled at a slightly higher strength of 46%. It will cost €55 per 700ml. Finally, Tomatin 40 Year Old has been aged in oloroso Sherry casks, bottled at 43% abv and priced at €1,250 per 700ml. The range will also be joined by the release of a one-litre bottle of Standard Edition Cù Bòcan – the distillery’s only peated whisky, first released in 2013 and aged in virgin oak, Bourbon and Sherry casks. It carries an abv of 46% and will cost around €49.95. 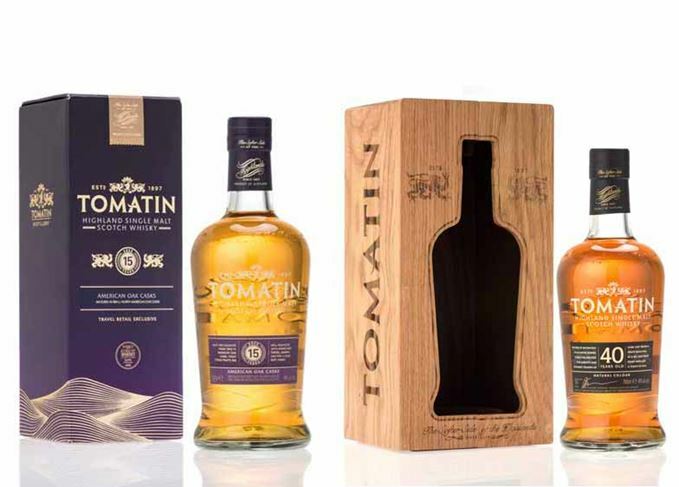 Stephen Bremner, sales director, said: ‘We have been working on a strategy to establish our presence in the travel retail market for some time now in response to growing demand for Tomatin single malt on a global level. ‘While the majority of Scotch brands have elected to present no-age-statement duty free ranges, our collection of age statement whiskies provides a point of difference. Tomatin – owned by Takara Shuzo Company – revealed a brand redesign of its core range in December 2015 as the ‘final piece of the puzzle’ in revamping its identity. Earlier this year, just 252 bottles of a 44-year-old single malt Scotch were released globally – the first in the distillery’s new Warehouse 6 Collection. A quartet of revamped Dalmores, Kilkerran goes to secondary school and Cù Bòcan re-emerges. Tasting three Glen Morays, Tomatin Earth, Cù Bòcan 2006 and Ardnamurchan’s latest spirit release. A trio of 17-year-olds from Benriach, Tomatin and Tormore, plus Cù Bòcan and a 1970s Benromach. Tamdhu Ámbar and Gran Reserva are the distillery’s first foray into global travel retail. The changes include a renewed focus on age statements and redesigned packaging.